Bike still won't run when hot - what to check next? K100-forum.com » Technical, repair and troubleshooting » Engine and transmission » Bike still won't run when hot - what to check next? Thanks everyone who has given me help so far! OK, my 1985 K100 won't run when hot. I recently discovered my thermostat was bad (wouldn't open at all in heated water), so I just replaced it with a used one that does work (opens in heated water). Unfortunately, that didn't fix the problem. It seems as though the engine is getting too hot (but my temperature warning light doesn't seem to work). It runs fine for 10 or 15 minutes, then gets a little rough when hot and starts to stall unless I rev it high. At that point I shut it off so as not to damage anything, and when it cools down it runs OK again. Any suggestions on what I should investigate next? The temperature sensor screwed into the stand pipe on the left side of the engine block has 2 NTC thermistors encased in the one unit. One thermistor is used to control the fan and the other is used to tell the ECU the temperature of the engine. When the ECU gets a reading from that sensor that says "engine is overheated", it will refuse to allow the engine to run until the temperature returns to normal. It's possible that this temperature sensor unit is stuffed and the one thermistor is providing the ECU incorrect information. Try changing that unit if you have a spare. If not, run the same test you did for the thermostat (i.e. 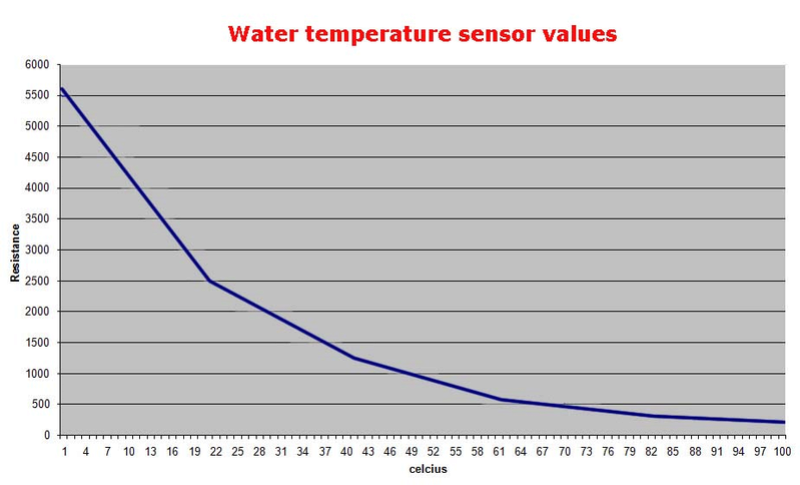 test at known temperatures) but compare the resistance readings with the chart on Bert's troubleshooting page. When that sensor gets to 111°C the light should come on and if it gets to 113°C it will refuse to start but will not stop the engine for reasons of safety that is to give you a chance to get of the road or at least to a safe place where you wont end up as road kill. I haven't tried it but I have heard that it wont start till the temp gets down to around 100°C. I seem to recall a thread here some time ago that was discussing this issue and it was the ICU that was dying when hot and some new heat-sink paste was the answer on the output transistors. I can't find the thread but that is not at all unusual for me. @RicK G wrote: When that sensor gets to 111°C the light should come on and if it gets to 113°C it will refuse to start but will not stop the engine for reasons of safety that is to give you a chance to get of the road or at least to a safe place where you wont end up as road kill. I haven't tried it but I have heard that it wont start till the temp gets down to around 100°C. Rick I remember that thread on the ICU too but not where it is. I changed that temp sensor at the weekend with a brand new one. The little tee the sensor is screwed into was packed full of crud and I doubt water was getting near the sides of the probe. Rather than take chances I put the new one in anyway and a definite difference this morning. But I don't think a malfunction in that sensor will make it run rough unless it affects the fuel mixture to the point it runs rough. Mine was giving a bad signal and it was running much too rich. A malfunctioning temperature sender will definitely affect the running of the bike. The mixture is controlled by the computer which relies on information given by the sender. Its a very cheap fix. @92KK 84WW Olaf wrote: Its a very cheap fix. Usually when those sensors pack it in they run rich. I think you will find the problem is with an electrical component that dies with heat. At $22 I suppose it's worth a try with that sensor. I replaced the coolant temperature sensor and that still didn't fix the problem. I also put a bag of crushed ice against the Hall Effect Sensors that I had replaced just to make sure the wiring wasn't the problem. The bike still runs fine for 20 minutes then cuts out and doesn't want to start until it's cool. Do you have access to a spare ECU (i.e. computer under the tool tray)? If so, swap in the spare to see if it isn't the ECU that is acting up. Since the temperature sensor did not change the symptoms, the problem might be with the electronics of the ECU. I've used crushed ice in a cloth, to find problems. But you might want to invest in a can of freeze spray, it's a lot easier to use and get into suspect places. @MartinW wrote: I've used crushed ice in a cloth, to find problems. But you might want to invest in a can of freeze spray, it's a lot easier to use and get into suspect places. @robmack wrote: Do you have access to a spare ECU (i.e. computer under the tool tray)? If so, swap in the spare to see if it isn't the ECU that is acting up. Since the temperature sensor did not change the symptoms, the problem might be with the electronics of the ECU. I have been down a similar road with my '83 K100. The problem persists and I have put it aside for a while due to frustration after numerous surgical interventions. Some time ago I had a chat with Cpt. Holister about this and he suggested I look at the valve gaps, particularly if tight. I earlier had measured gaps and found several to be slightly tighter than minimum spec. but had no acted to fit new shims to correct them. When I pick up the scalpel next, I will replace the shims to return the tight gaps to correct spec. I note in your post you had found... "intake valves are a little tight". Have you re-shimmed the tight valves to get them to correct spec? I presume that tight valves will produce increased engine and coolant temperature, possible contributing to cut-out when hot. Start the engine and see what gives up when t starts to run a little rough. I recently had a problem on my own and found a defective Fuel Pressure Regulator. When hot, the bike was backfiring in the exhaust when I was throttling down. This was happening between 4,000 to 3,000rpm. The engine was starving for gas and didn't burn the mixture correctly. As a result gas was accumulating in the exhaust. As the FPR is very difficult to access (I have the sidecar in my way and there is no room to work), I temporarily solved the problem by removing the vacuum line coming from the throttle body. (Before people ask, yes I plugged the vacuum port with a rubber cap). Yesterday I started the bike and opened the fuel cap and looked inside, the gas was fairly low and I could see gas swishing inside as the fuel pump worked. Is that normal (seemed odd). I couldn't tell where it was coming from - it seemed to be going front-to-back down the plate that faces you as you look into the tank, but wondering if it's turbulence from the pump sucking in gas from the bottom left where the fuel pump intake is. I also do have an extra ignition control unit, so i'll replace that and see what happens first. @timz10000 wrote: Yesterday I started the bike and opened the fuel cap and looked inside, the gas was fairly low and I could see gas swishing inside as the fuel pump worked. Is that normal (seemed odd). The swishing is the return line from the Fuel Pressure Regulator.